Here is a short Youtube video explaining what this post it about. How did I do it? I will try to go through the main steps in the following. So if you want to light up the LED number 2 for example, you have to apply a current to the green cable, and pull the brown cable to the ground to allow the current to flow. In general, for every LED there is a specific combination of two buttons that you have to set. But as if that is not complicated enough, you introduce some dependencies with this setup. What if you wanted to light up LED 1 and 6 simultaneously? You would have to supply the yellow cable with current for LED 1 and the green one for LED 6. Also, the brown and red cables would both have to act as ground. But wait a minute - in this configuration, the LEDs 2 and 5 would light up too, as both are now exposed to the same current as LEDs 1 and 6. I worked around this dependency with a “cheap” trick: When multiple LEDs should be activated, I light up one LED after the other, but switch between the LEDs at such a high frequency (about 5 ms for every LED) that with our surprisingly limited visual system it looks like the LEDs are actually glowing at the same time! 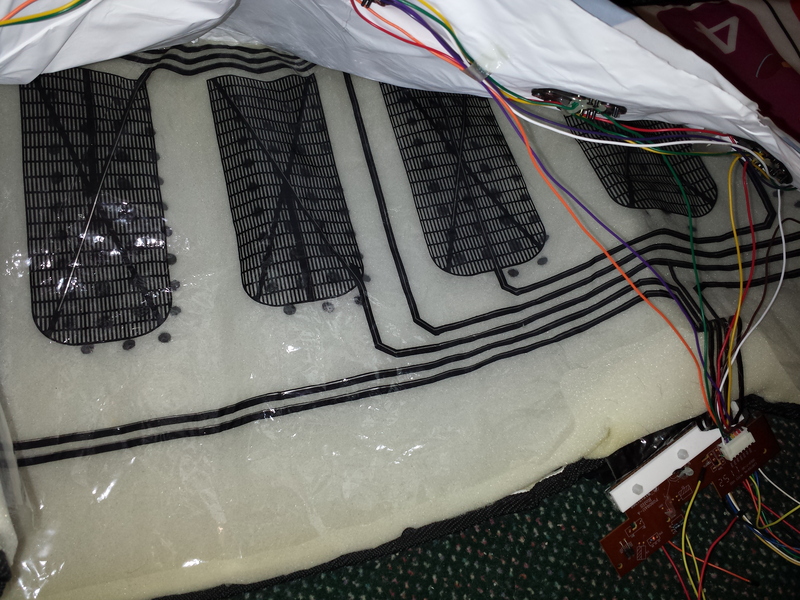 Unfortunately, the wiring of the buttons turned out to be even more confusing than those of the LEDs. Basically, inside the mat there are two layers of foil separated by a layer of foam. The foil has conductive areas at the position of each button as well as black lines that connect the buttons to the PCB in the toy. When pressure is applied to a button, the two layers are pressed together as the foam gets squashed, and a current can now flow between the two layers of foil. So you can model this button as a resistor that changes in resistance depending on the applied pressure. I hope the picture below makes everything a little bit clearer, where you can see one of the layers and the electrical connections in black, and the foam underneath obstructing the second layer below. Similar to the buttons, the wiring was not straightforward, as you can see in the following schematics. For both layers, the connections accessible from the outside are drawn at the top. It assumes that current is applied on the digital pins 10 to 12 and the resulting voltage measured on the analog pins A0 to A3. For each coloured cable, the buttons that are connected to it are displayed. The matrix entries show the specific button addressed by the combination of two of these cables. So the idea is to apply HIGH to one of the three digital pins, while letting the other connections float, measuring the four analog voltages, and then selecting another digital pin to set to HIGH and repeat the procedure, and then do the same thing a final third time with the last remaining digital pin. The picture below shows a schematic of the Arduino setup for the analog pin A0 and demonstrates how setting exactly one pin between 10 and 12 to high allows for the measurement of the voltage for exactly one of the three buttons. It works analogously for the other analog pins A1 to A3. Finally, I programmed my Arduino to periodically read these values, detect button presses using these measured voltages, and send the button states over the serial port, where they are received by the Unity game engine. The video game itself was developed in Unity, which is a game development platform suited to build your own 3D as well as 2D games without going through the hassle of creating your own game engine and taking care of every little detail yourself. I can really recommend it to people interested in game development, because it represents a nice, accessible starting point for further endeavours. 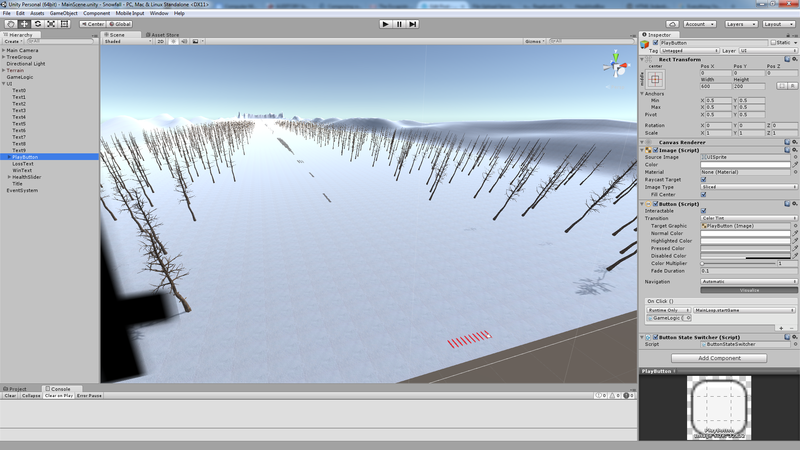 I quickly added some hills and a snow texture to the terrain, placed a lot of trees and obstacles (barely visible in the middle of the screen) and added 10 red skis with their positions relative to the main camera, so they move along with the player. Because the scene is rendered from the perspective of this main camera, for the player the skis do not seem to move at all. 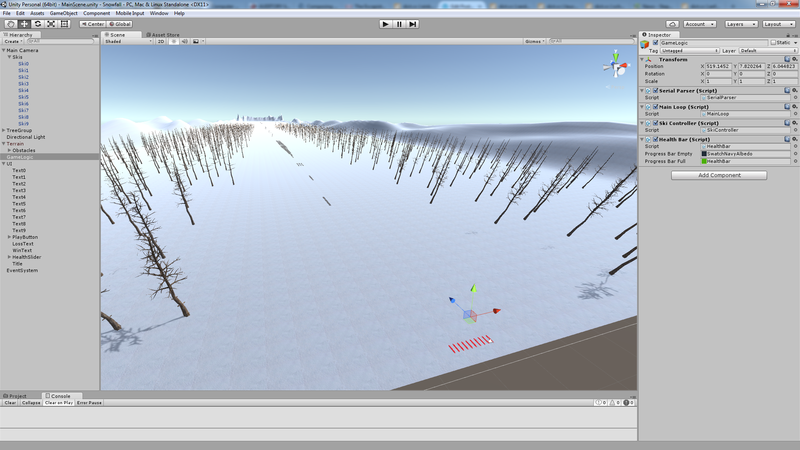 On the left side, you can see the scene hierarchy, containing all objects of the scene organised in a tree-like structure. As stated before, the skis are a child of the main camera object so that they do not change their position on the screen. The TreeGroup contains all trees, a directional light acts as the sunlight and the terrain features a set of obstacles in the form of many thin cuboids with a rocky texture. The UI consists of text labels from one to ten for every ski, a play button, a health slider, a title text for the start screen and a loss and win text shown when the player loses or wins. It is also simple to set it up so that a specific function in your own script is called every time the button is pressed or the slider is moved. Finally, the “GameLogic” object contains most of the C# scripts responsible for handling most of the game’s logic. I say most because some scripts are attached to specific game objects like the main camera. I will conclude this post with the code of the main loop during active gameplay. Hopefully, it is comprehensible with the extensive comments and can further develop your coding skills in Unity. In this post, I want to talk about magnitude spectrograms as inputs and outputs of neural networks, and how to normalise them to help the training process.